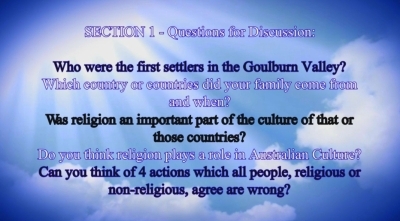 In order that we might know who we are as a community in Australia, and in the Goulburn Valley, and Greater Shepparton, we must first look to our past and understand how we as Australians co-existed as a homogenous community. Australia has had a rich past, settled first as a convict colony with British overseers and governors. Among the prison colony were people of all religions, who worked together, took their recreation together and established their land holdings side by side, particularly in the case of freed convicts. To this we owe the origins of our harmony, and our basic Australian Values were founded on a simple egalitarianism. The following video below was produced for students at secondary and higher levels of education. It examines our history, our background and our values as a nation and enquires into the foundation of the harmony we have in Australia today in the light of continuing migration and integration. This video can be made available for schools and educational institutions at cost plus postage and packaging. For enquiries, please use our contact page.